With the new season of Sherlock rapidly approaching (*internal screaming*), the fandom is stirring from their comatose slumbers and starting to get excited (see: scared, worried, and a whole host of other emotions) again. So what better way to celebrate the incoming of our favorite heart-wrenching duo than to throw a holiday party? The first step to any party is planning it. Thankfully, I'm here to do that part for you. But you still have to do the work to make it great. So read through this article first and figure out which ideas you're going to take in order to custom make your very own perfect Sherlock holiday party. Then make your holiday party a hit this year. As for the attire, you can go multiple ways. You could throw a normal friends get-together with jeans and just theme your party; you could tell people to come in cable-knit sweaters and collared coats and have your guests be a part of the theme; or, my personal favorite, make it a black tie event. Have the women come in fancy dresses and the men in suits to imitate Sherlock and Watson's own Christmas party. And who doesn't love a good excuse to dress up? It's a holiday party, so your main decorations are going to be holiday decorations. Lights, garlands, a Christmas tree, mistletoe--whatever you think is holiday appropriate. After you've got that figured out, we can start delving into the less holiday appropriate (but super cool) Sherlock-themed decorations. 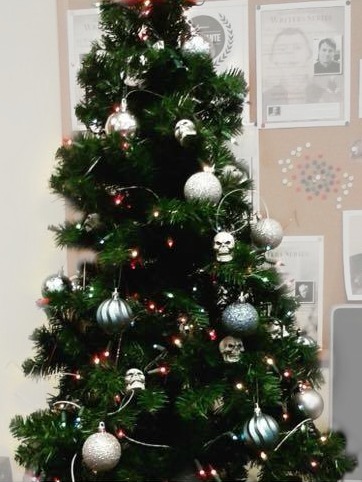 Like this skull tree. The great thing about a Sherlock holiday party is that Christmas comes not long after Halloween. So, get that thrifty on and reuse all your Halloween decorations! While the pumpkins might be a little out of place, the skulls and bones, black flowers and tablecloths, and (forgive me) tombstones can all fit into your theme. Just make sure to string garland and lights over it so you can be festively sobbing. Beyond reused decorations, if you've got time on your hands and want to get or make decorations specifically for this party, you can scour thrift stores for old copies of The Adventures of Sherlock Holmes or other old, pretty books to set around under other decorations, or even just some magnifying glasses, globes, beakers, and other small knickknacks that look like they could be found in Sherlock's apartment. You could also make Sherlock Holmes-themed paper lanterns, black lotus napkins, or a bookish paper garland. So many options. This is your party--make it look like everything you love from Sherlock. While the the initial choice for music might be the score from the show, that could easily get old, leaving your guests anxious, irritable, and not quite sure why. Instead, find a nice playlist of Christmas carols played on violin to have on in the background. That way, you can stay true to your Sherlock theme while keeping in the Christmas spirit. Plus, who doesn't like string music? Now, the food depends in part on what attire you chose. The fancier the dress, the fancier the food. Obviously that's not a hard and fast rule, since one of life's great pleasures is getting dressed up and drinking juice boxes or eating a five-star meal in sweats. But people usually expect certain things from parties, and one of those things is consistency. Anything else, unless carefully planned, just looks shoddy. So here are some food themes to get you started thinking about what to feed your Sherlocked guests. Fancy finger foods. Foods you can't pronounce the name of. Wine that costs more than six dollars. Anything you would find in a restaurant that you can only afford to go to once a year, or at least the cheapest approximation of it. You don't have to be rich to pull this off, you just have to be willing to spend most of your party budget on food. Not hard with reused and homemade decorations and access to Spotify or YouTube. Make it look nice. Use neutral-colored plates and serving utensils: white, silver, black, wood. Make your own appetizers--it will be cheaper than buying them frozen. Search "fancy food" on Pinterest and you'll find tons of recipes that are fairly simple, but look incredible. If you can't cook, find a friend who can. Parties are more fun when you plan them together, anyway. Remember: no puns, no frozen pizza, no Sherlock decorated cupcakes. Boring? Probably. But it's classy. And class never goes out of style. Now let's get on to the fun stuff. The possibilities are endless. Come up with your own! (I can't claim all credit for these; some of the ideas came this site.) And, like me, if you can't come up with enough of your own, scour the web. You can find anything on there. 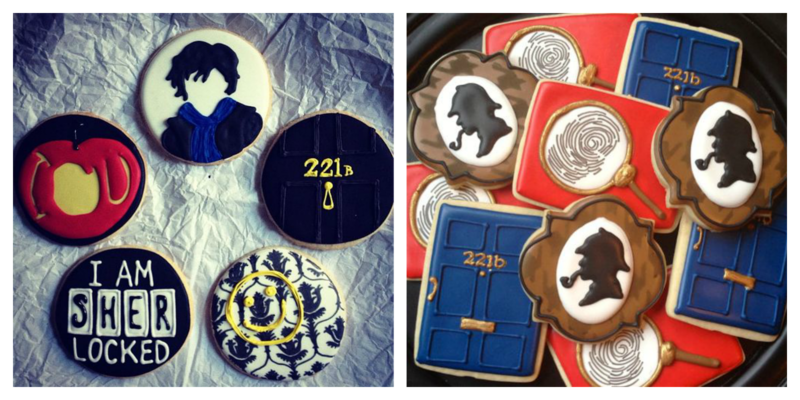 The next option is probably the one most people will go with: Sherlock-themed food. Waffles aren't a particularly Sherlockian food necessarily, but that pun is too good to pass up. 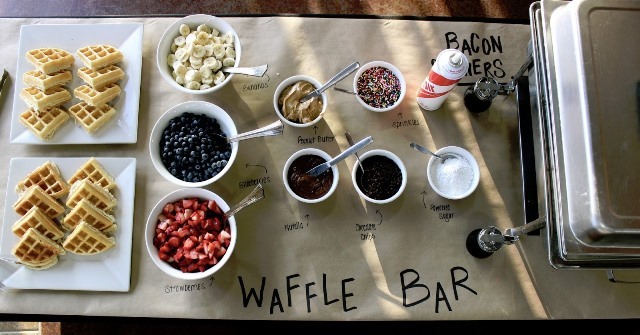 And who doesn't love a good waffle bar? Finally, after you've got the food situation squared away, you'll need drinks. For those of you twenty-one or over, a couple of bottles of wine are always good for a party, fancy or not. A good mix of red and white, sweet and dry. Or consider having some Sherlock themed cocktails. Make up your own, or check out these or these. Obviously, you'll need tea. This isn't really optional. And of course, the party staples: soda, punch, and/or iced tea, and water. Lots of water. Especially if you're also serving alcohol. Stay hydrated, kids. So, in order to avoid the awkwardness involved in people desperately wanting to leave but not wanting to show it, try some of these activities. Then, proceeding like a white elephant gift exchange, everyone goes home with a scarf they didn't bring. There are countless ways of going about this game; my personal favorite is to sit in a circle, put all of the scarves in the middle, then draw numbers, number one picking first and then number two either drawing from the middle or stealing from person number one, who then draws another from the middle. And so on. Another option would be for the host to pick first, and the person whose scarf they picked to go second and so on and so forth until everyone has a different scarf. Some ideas for fillers are candy, cookies, make-up, holiday socks, trinkets or toys, coffee beans, jewelry, or gift cards, if you want to get fancy. Maybe avoid the breakable things--one way to make a party awkward fast is to make the host clean up glass. Let's play murder. As Sherlock does at Watson's wedding, you, too, can play murder. You can introduce it as he does in the show, or you can casually bring it up at some point. If you were going to murder someone in this room, how would you do it? And who would be the easiest? It's more of a lively discussion than a game, but you can have prizes for the best thought out answer, chosen by popular opinion, if you wish. Be careful to only play this with people who would have a good sense of humor about it--we don't want people getting their feelings hurt. That's no fun at a party. Mafia. This is a common party game. The rules can be found here. As a Sherlockian twist, rather than a sheriff and doctor, have the chosen be Sherlock and Watson. For more twists, add Mycroft as the informant and Moriarty as the serial killer. Or come up with your own ways to play. Pin the Mustache on the Watson. Fairly self-explanatory. Be sure to include a cable-knit sweater and severe mockery. 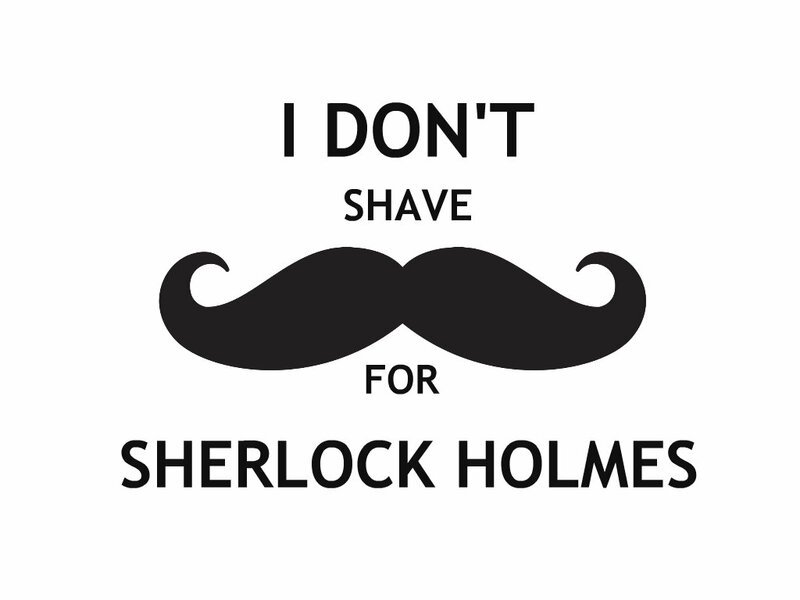 Include the caption, "I don't shave for Sherlock Holmes." Some other options would be a hit-the-smiley-face nerf gun challenge, Sherlock trivia, a photo booth, a game of wits and poker faces involving salt and sugar packets or similar-looking shots, or, if you want to go all out, making the whole theme of the party a murder mystery dinner. For a less extreme version of that, include on the invitation that a crime has been committed (make sure they know it's a game), and then leave subtle clues all around the party so that your guests can be clueing for looks all evening. The first person to solve it gets a prize. Or just bragging rights. The most obvious entertainment of all would be to watch an episode of Sherlock. Whether you're watching the new one the night it comes out, watching the Christmas special, or watching "A Scandal in Belgravia" and watching Sherlock's own Christmas party, entertain your guests with the stunning BBC masterpiece you all love. 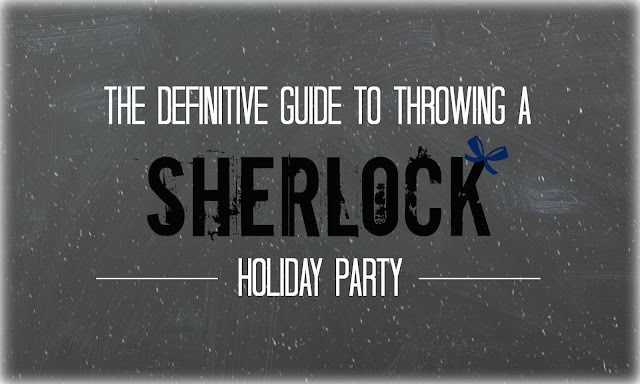 Hopefully you're departing this article with ideas for your own Sherlock holiday party. 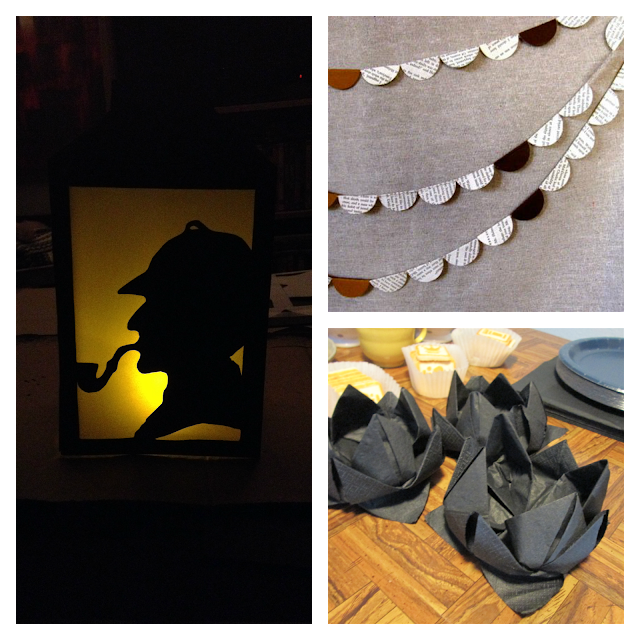 If you need more, check out this article for how to throw a Sherlock premiere party. And, whether you throw your party this week, on Christmas or New Years Eve, or for the season premiere on January 4, make sure you take time this holiday season to have fun and appreciate the people who are always there for you.